ANAHEIM, Calif. – Less than five miles away from “The Happiest Place on Earth,” the Hawai’i basketball team was left with sadness. 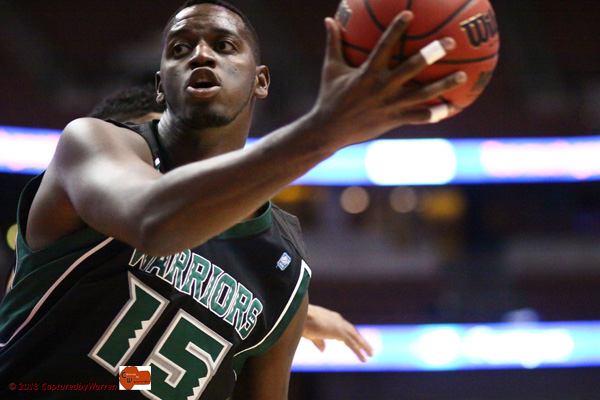 The Warriors were eliminated in the quarterfinals of the Big West Conference Tournament after a 71-60 loss to UC Irvine on Thursday night at the Honda Center. The loss likely ended Hawai’i’s season with a 17-14 record, as they are considered a long shot to receive an invitation to a postseason tournament. UCI improved to 19-14 with its second win over the Warriors this season. The No. 4 seed Anteaters will face No. 1 Long Beach State in one semifinal game on Friday. No. 2 Pacific and No. 3 Cal Poly will meet in the other semifinal. 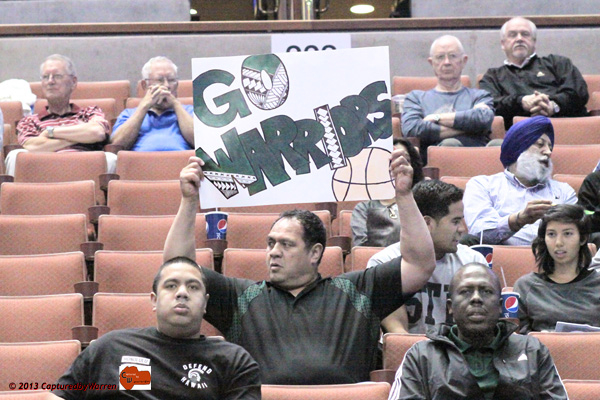 A crowd of 3,942 – including several hundred Hawai’i fans – watched the No. 5 Warriors fall into a hole early in the game, and it proved to be too deep to climb out from. “I really thought that Irvine did obviously a great job of jumping out early on us and bringing some intensity that you need at this time of the year,” head coach Gib Arnold said. The Anteaters went on a 17-0 run early in the game to take a 24-5 lead, and the Warriors never quite recovered. Senior wing Hauns Brereton led the Hawai’i effort with 18 points, nine rebounds and four assists before fouling out in the final minute of the game. Senior center Vander Joaquim added 18 points and six rebounds. He scored 16 in the second half, when the Warriors managed to cut a previous 23-point deficit down to 10. Junior forward Christian Standhardinger contributed 11 points and eight rebounds. Senior point guard Jace Tavita did not score, but passed for six assists. Freshman reserve guard Manroop Clair got extended action after the Warriors fell behind early, and he responded with eight points and two assists in 22 minutes. UCI attacked from all angles, both offensively and defensively. Six Anteaters scored in double-figures, led by center Will Davis II with 13. Senior forward Michael Wilder added 12 points, 10 rebounds and four assists. The Anteaters’ biggest lead of the game was 42-19 late in the first half, and they took a 44-22 lead at intermission. 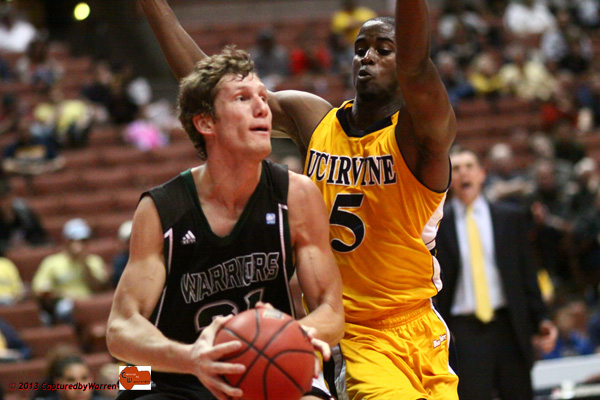 The Warriors responded with an 11-0 run to open the second half, cutting the UCI lead to 44-33with 16:47 remaining. Hawai’i got as close as 10 several times after that, but could never get within single-digits of the Anteaters. 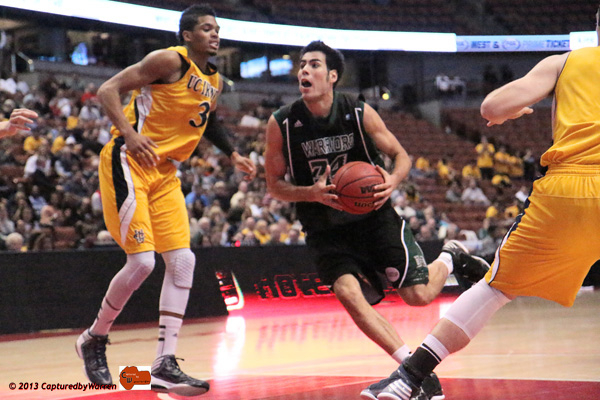 Hawai’i’s field goal percentage of .349 was its lowest against a Big West opponent this season. The Warriors had a .265 percentage in the first half, then .448 in the second half. The Anteaters had a .583 percentage in the first half, and just .250 in the second half, and finished the game at .404. UCI also out-rebounded the Warriors, 40-38. In an effort to combat the quicker Anteaters, the Warriors went with a smaller starting lineup. Junior guard Garrett Jefferson started in place of freshman forward Isaac Fotu. Jefferson finished with three points, while Fotu scored just two. Junior guard Brandon Spearman missed his fifth consecutive game with an ankle injury. He was in uniform for the first time since he injured the ankle February 16. The Warriors are on a three-game losing streak, and Arnold said the possibility of a shot at a tournament such as the CIT (CollegeInsider.com Tournament) has not been discussed. The pairings for all postseason tournaments will be announced on Sunday. Many Thanks to all that watched over our son and supported him during his time in Hawaii. We are so grateful for all the Aloha the fans have given Hauns as well as the team. He had 20+ offers on the table to some of the greatest schools in the country but he really felt he was led to you. So Thank you UH Fans for making this a great experience for him. Thank you warrior insider too! As for Coach G A and Coach T………. Unlike last years 16-16 team, this years team had talent. Hauns Brereton is as good a small forward as you could ask for. Juaquin Vander gave 100%. Christian Standhardinger is NBA material. Isaac Fotu wii be NBA material by his senior season. So why are they only 17-14? I hate to say it but its the coaching. I don’t like to berate Gib but I feel thats where the problem lies. Other teams when their down at halftime 10 to 20 or more points to Hawaii come back in the second half and make adjustments. You can even see the adjustments. Gib when his team is being slaughtered at halftime, you don’t see notable adjustments and the team usually loses. This team has too much talent to blame the players. Ben Jay may have to pull a Dana Takahara-Diaz. Gibs best year was his 1st year. And thats because Bill Amiss, A Bob Nash recruit was on the team. I haven’t seen a improvement in his coaching in this his third year. I don’t hate Gib, I like him. But he’s being paid a six digit salary and not cutting it. If we continue to fall like this, the crowds will dwindle and UH will lose thousands and thousands in revenue. And I think UH administration are aware of this. Laura Beeman in her first year as womens bb head coach is doing better. She was up for BWC coach of the year. Bob Coolen with a tiny budget, look what he’s done with Wahine Softball. Trapasso is having trouble with the baseball team, only two wins out of nearly 20 decisions. This the worst baseball team I’ve seen since following them from 1970. And Norm Chow is coming off a 3 win first season. I think his offense is boring. I miss the run’n’shoot. Pay June Jones 4 million a year and please bring him back. I think Coach and the team did well, considering the youth and injuries that we had. Not having Spear’s leadership, defense and mature play hurt us in the tournament. UCI was a hot team coming into the tournament, and it would not surprise me to see them take it. Next year, with Spear, Shamburger, Standhardinger and Fotu returning, we will have a solid foundation. I expect Valdez and new recruit Michael Thomas to contribute immediately. Jefferson, Jawato, Dressler, Rozitis, Roop, Oz, Harper, and Enos will be a year older, and a year stronger. With all the home games we play, I see 20-wins and playing throughout March. three straight losses to end the year is unacceptable. If gib if let go I will not be surprised. I’ll miss Hauns and Vander, they played their hearts out last night. just was too little too late to make up for the horrendous start. Ratbird UH is not gonna pay June jones 4 million a year for results like he is giving SMU, 6-6 records with hawaii bowl wins are not worth 4 million dollars sorry. Aloha to the Memphis Brereton Ohana: Mahalo to Hauns for choosing the University of Hawaii. Hauns is a very nice young adult. He gave it his all. Who could forget his double clutch shot to tie in regulation the Xavier game in the Diamond Head Classic. He will have a great post graduate career in either some form of pro Basketball or business. Mahalo to the Breretons!! Aloha and Thank you again to Ozi’s mother, in a second language and having to translate what she wants to convey as well as trying to understand our comments is commendable! Ozren has a great mother, very caring! Ozi Mum, you will see Ozi do well too. Keep giving him calls, he appreciates that. Or on the other hand ,I am sure Ozi calls you! Mahalo and Thanks finally to Aussie Mum, great that your Ohana, family came out for the Diamond Head Classic, your son Michael is a classic person, and appreciated by coach, team and fellow students. A truly nice young man from down under! Thanks to the Harpers for sharing Michael with the UH MBB team and Hawaii! Thanks to Tonganator for your comments , your SURPRISE visit,so touching to see Isaac end of last year. Isaac comes from good stock. Great mom and dad, and siblings! Isaac will just keep getting better and better. Tell Isaac to continue to shoot the ball, he could be a co-leading scorer with Christian next year.He is another one who could have been playing in the Big East however he chose UH. Mahalo to the Fotus! Mahalo and thank you again Dayton, the other forums call this the SAFE message board. I feel that way. I tell my family to post away, yet keep it dignified. Appreciate this site, and hopefully it is up and running for next season and seasons to come! Thank you to the very patient Ohana of Airon Valdes, his best playing days are yet to come! The athleticism your son Aaron will bring TribeV will be exciting to watch. He and Michael Thomas, will help team to compete with the Big West teams for sure! Mahalo plenty, thank you! Mahalo plenty, thank you Warrior Insider. It has been an up and down season, however when certain players get injured, or go into slumps, sometimes that is what happens, either team steps up, i.e. (for example)the 5 game win streak with that awesome 3 game consecutive win streak, or teams might lose 4 out 5 games, sort of like this year when Spearman got hurt. I don’t think Gib Arnold will use as an excuse, however, having played sports, Basketball and American Baseball and Football, the one sport Basketball, if you rely on 5 or 6 key guys to be competitive, if one of them gets seriously injured and is out indefintely, that is what happens, the case with UH going into a tailspin at the end of season. Love that UH, upon going over the DVR replay again, never gave up, till the final buzzer, no quit in them. Love Gib or loathe(don’t like)him or his coaching style, it is a tribute to his love of his players, and the HIGH CHARACTER and Good Attitude of the 1-16 student athletes for the University of Hawaii at Manoa Warrior(Rainbows for the old fans)Basketball team. Mahalo to all! Will hope to see your posts, after April Banquet, and any news from Dayton and WI on possible additional recruit or recruits if any. Then we all get excited again. I can sense the frustration, and as a long , long time MBB fan, if felt is too, almost developed acid reflux. Oh, but there is so much more to life, family, faith, and taking care of each other and the planet! Ben Jay will sit down with Gib ,and they discuss Basketball , the state or direction of the program. I think Gib in terms of athletes the type of people they are ,he is in the right direction. We know he and his staff are constantly recruiting, so next year will be an upgrade in overall speed and athleticism, added to the experience of Spearman, Jefferson, Clair, Pavlovic, Jawato, Davis Rozitis, Harper, Standhardinger, Fotu, and the experience gained in system by the hard working Red Shirt athletes, Shamburger, Enos, Dressler, and Valdes. Keep us posted Dayton. We love UH Men’s Basketball and all UH athletics! Until next year , aloha fans, Uhfanzonly1, playhoops, and thousands of other UH MBB fans will wait till start of next season’s practices in Oct 2013. We can’t wait! P.S. great support and Mahalo to the Schmidts and Ameriprise Financial, great , great supporters of UH MBB and Warrior Insider! Good 2nd half effort, but down 22 points is tough to overcome. As the old adage goes…..wait ’til next year. Sorry, I have to disagree what Ratbird said. Standhardinger and Fotu are not NBA material. But, they will be able to find pro jobs after school and play in either Europe or in Asia. To make it to the NBA is the creme dela creme of basketball. Very few make it and some of them that do don’t last that long. Derek: Maybe at this point Isaac is not ready for NBA or high level Euro Pro leagues, or even Christian. However, after next year, if Christian improves and gets stronger, who knows? Probably not a draft pick. However there are hundreds of guys who have free agent tryouts. Think back in the day, I though these guys would never play NBA, not quite creme of the crop, or that level of talent, which you are correct , the NBA guys are elite athletes. Tommy Barker 6’10 1/2″ 230, kind of soft and under acheiver, he was drafted in 4th round by Atlanta Hawks, he spent a couple of years in NBA with Hawks, Knicks , Celtics and Rockets. Undrafted, not NBA type, or not seemingly good enough to get a look ? Trevor Ruffin , free agent with Phoenix Suns and Philadelphia 76ers for parts of 2 seasons, Free agent signee. Undrafted, Predrag Savovic, parts of 2 seasons, free agent signee with the Denver Nuggets. Undrafted. AC Carter, about 13 seasons, with Heat, Spurs, Nuggets, Timberwolves, didn’t have jump shot, a great one, maybe not NBA material ,he played the longest of any former UH player to play in NBA. I though in college Trevor, Tommy Barker, Predrag Savovic and AC Carter were good, However I didn’t envision them as being on an NBA roster, and in AC’s case for 13 years! So, Fotu only a freshman, he has 3 years to grow, physically, emotionally, BBIQ, Isaac’s footwork is great, he has to get faster though and be able to run floor. Also increase vertical leap. Those are things, in Isaac Fotu’s hands. He works very hard, at least by senior year, and that is his goal, he will have a shot at an NBA roster, maybe by free agent tryout, or if he is really tearing it up , leading the nation in field goal percentage, rebounds, scoring, an NBA draftee, that is his dream. If Savo, Ruffin and Carter could make NBA as free agents, I give Isaac a chance,remember we have only seen Isaac for one year of NCAA DI ball, and he was co-freshman of the year in BWC, also one of the top freshman in all of NCAA. Christian, don’t count the guy out, he is such a hard worker,, ones might say, he has no NBA talent, however, a lot of journey man, roster, role players in the NBA, Christian has to get stronger, increase, speed and vertical, and shoot FT’s better. Without question, he will outwork just about anyone,, next year, I would not count out Christian getting at least an NBA free agent tryout. Any NCAA MBB player that works hard towards their dream, making an NBA roster, I would not count them out., Isaac, and Christian have as good a shot as any player in the nation. We have to wait and see. I love their games and attitudes!! Yes Josh, I agree UH would not pay June Jones 4 million to return. I would if I was filthy rich. June was a players coach. He gave 2nd chances to players who had troubles with the law in the past,, i.e. Colt Brennan, Pisa Tinoisamoa,etc. But I am hooked to the Run’N;Shoot. Even when we lost, it was exciting. This present offense is boring. Derek, maybe Christian, Isaac are not good enough for the NBA. Remember Roderick Fleming? Under Bob Nash. He could’ve been NBA material. OH if Gib could have him under his wing for 4 years. In retrospect, most acknowledged that this team was a work in progress. There were many new faces, lots of them freshmen. Along the way they teased us with their potential and there was lots of excitement along the way. I believe this team has made progress. The future looks great with more talent onboard. I believe Coach Gib is moving in the right direction, maybe for some not fast enough. It’s going to boil down to what have next year’s players learned from this season and what are they going to do now to improve.For example, they played against some great guards with nasty ball handling skills, will our returning guards use them as models? If they have a plan to improve and work that plan, they will be tougher next year. I look forward to seeing them play in the summer league at Manoa wetting our appetites and winning the Big West next year. Dismal end to the season , UNACCEPTABLE, the program went into a tailspin over a month ago losing games at home that were must wins, losing on the road, now in the first round . We have to have a better balance of players in the system, more JC players with experience and skills that can step in right away and handle the pressure, this is what we need to do NOW. I noticed one definite thing. We were slower than our opponents. We were slow cutting, we were slow moving periphally, we were slow head on speed. An we were terrible at anticipation. Tom Henderson and A.C. Carter were great at anticipating their opponents move and always stole their ball. We moved on the court like 60 year old men talent notwithstanding. We won’t be any better next year if the new comers are slow too. And a shooting guard and a good point guard is a must!!!! And Vanders replacement is a must. Davis Rozitis is too skinny to hold/block the center paint. Valdes can leap but is he fast? Is Shamburger fast? Christian and Isaac are very talented but they are very slow. The thing that made Magic Johnson, Kobe Bryant, Michael Jordan great was they were not only great shooters but fast fast fast. If 60 year old men sre next years replacements be ready for another “over the hill gang” edition. They may have to reactivate Arty Wilson and Tony Maroney. so who’s leaving the team? Anybody’s guess, there will be movement as Gib made statement last season when all the movement was going on , as much as 40% turnover amongst freshmen nationwide make moves . Boy, thought the intent of this blog was to be supportive of the team and not a naysers forum. Notwithstanding, Shamburger for example is not only quick but fast, check out past videos. Believe next year’s team has the speed, but needs to improve on quickness. In year’s past UH went the route of JC players and most took a year to adjust and in their senior year they played better. Let’s be honest when you are not bringing in a top 50 high school player, it’s going to a “growing” process. The young players we have like Isaac, Manroop, Ozi and Valdes are going to be outstanding if they continue to improve because of their potential. As the faithful, we have to believe and encourage their growth. Most times, the players that stick it out for 4 years turn out to be the stars of the future. Cause for them it’s about setting goals and working hard, don’t you see this with this group? If not, recommend turning the channel. Hey Tako ,Gib’s the boss, he does the recruiting responsible for the success and failures of his recruiting efforts, if he doesnt like something about a particular and found someone else who he thinks will help the team better, he will make the move, scholarships are not gimmes they are one year renewable scholarships, and Gib is the the Boss. Not us. Changes will be made as he sees fit and that’s the bottom line whether you agree or disagree , Not everything in life is milk and cookies, this is survival for the coaching staff, winning counts, losing gets you fired. Hey Tako ,Gib’s the boss, he does the recruiting, responsible for the success and failures of his recruiting efforts, if he doesnt like something about a particular and found someone else who he thinks will help the team better, he will make the move, scholarships are not gimmes they are one year renewable scholarships, and Gib is the the Boss. Not us. Changes will be made as he sees fit and that’s the bottom line whether you agree or disagree , Not everything in life is milk and cookies, this is survival for the coaching staff, winning counts, losing gets you fired. It has been interesting reading all of these comments both positive and negative through out this basketball season. I believe all comments agree that Gib Arnold is a very good recruiter, unfortunately good recruiters are not always good game time coaches. Maybe 4th year will be different???? This team has good players but were not used to their potential. Adjustments by the coach were not made during games that needed to be. Players left in game too long, resulting in tired legs. Some of these players are quick (garrett, jawato, spearman, manroop) but offense was always run slowly. Hopefully next year with a new PG ball will move better both inside and out. The 3 seniors gave it their all. Hauns came on towards the ending part of the season and was a steady force. He was our best free throw shooter too. He had a shooting spell around the time after the Illinois game through the beginning part of the BW season. Vander was one of our best players, yet I still didn’t like how he held on to the ball when it went in the post or on the wings. He was very relunctant to give up the ball and wanted to find a way to get a shot up. Wasn’t he taught to kick it back out and ask for the ball back in when he was double teamed? If he did, he was very slow. Tavita had an up and down campaign. He did well to distribute the ball, but he was a relunctant shooter because he knew he wasn’t a good shooter. He played to his strength which is assisting. Unfortunately, PG handles the ball so much that he much shoot the ball, plus feed his teammates. The ideal was to have the PG score about 10 points per game, and about 5 assists per game. 10 points. That’s about 3 to 4 field goals and 2 free throws. Next year, Keith Shamburger is at least a 10 and 5 PG. That’s his production at San Jose St. He is a heady player and he can shoot the 3 too. That said, here is my first take (not ESPN) on next years teams, assuming all the players are returning. That’s a big if. I here a lot of talk on other sites that Ozi will not be coming back. Been reading that he’s not happy with his playing time. But, I don’t know for myself. I think Arnold should go small to get more shooting and speed to counter BW teams. Thus, here’s the projected first team. PG – Keith Shamburger – he’s a proven Divsion I basketball player and he will be solid. He’s not tall, but he’s a player. Definitely, an upgrade from this years team. G – Brandon Spearman – he’ll be a senior and he had a very decent junior year. He can slash and he can hit the outside shot. G – Manroop Clair – by the season starts in November, Manroop will still be only 18 years old. He grew up a lot this year. Started in the beginning, then went to Siberia for about 2 to 2 1/2 months by Arnold. I think Arnold made a big mistake in not playing him in the rotation. Roop is the quickest of the guards and he’s a shooter and a scorer and he can go inside too with some good moves. He will work on his defense. F – Isaac Fotu – 42 should move into the starting role. He can work on post up moves facing the basket and work on medium jumb shots. Would like to see him have a nice jump step and a doulbe cluck move to get more fouls. F – Christian Standhardinger – he’s got a lot of energy, sometimes out of control. He’s got good anticipation for putbacks. I think his shot is too high of an arc on his free throws and jump shots. Bring it down a big and he’ll be more deadly. Coaches must work with him on that. C – Rozitis will spell either 42 or Christian. Dressler will also sub in in spots. F – Thomas, Valdes, and Ozi, and Jawato, and Harper will come in to spell Spearman and Manroop. G – Jefferson and Enos will be in the wings for fill in at PG with Manroop also playing point, if needed. Jovanovic might be a redshirt candidate. Thomas could redshirt too as well as Harper. I count 5 potential good 3 point shooters (Shamburger, Spearman, Clair, Jawato, and Pavlovic). Between them they care capable to hitting about 10 3s per game. Practice, Practice, Practice, make perfect. Wow! Not unexpected. Irvine redhot, and just defeated LBSU in semifinal to advance to championship game. LBSU, regular season champs auto invite to NIT. Irvine could run the table and win championship game auto invite to NCAA. UH Post season possiblity, I don’t know ,maybe a long, long shot. Now, LBSU was defeated by Irvine so LBSU gets NIT auto bid. If Irvine is champion they go to NCAA’s. That would leave , if offer still stands, Pacific and Poly receiving invites to CIT(College Insider Tournament). BM says to hold on. have to see, CIT, because of LBSU out of running for NCAA and already locked into NIT and Irvine upsetting them, changes dynamic. CIT would now choose another team from the West to invite. Could it be Hawaii? As the third Big West team, the way the season has gone, probably, CIT chooses a team from WAC, WCC etc. All thanks to Irvine beating LBSU! No guarantee, and probably UH is done, however sliver of hope..we shall see…Ben Jay get on the phone to Riley! Per Jeff Portnoy who’s been broadcasting all season this program needs a lot of improvement in the talent level just to be competitive in Big West Gib will be busy finding players for next season. He further said today stating further that season shoul be classified as a disappoiment due to schedule that included a lot of crappy teams. Personally, I think Pacific will win the tournament title. Coaching staff currently recruiting, bring in some thoroughbreds Gibber ,we need athletically quick guys that handle and shoot the ball. Time is running short . So much negative talk. Yeah, I believe coach made mistakes here and there, but what coach doesn’t. This is his first full recruiting class. Give him one more year. I think we’ll be good. With that said, UH will be better without Vander. That guy was an absolute disappointment this year. Too much “me” ball. I mean did he think of himself only or did he just not learn anything. The knee injury I’m sure affected him, but passing out of the post doesn’t require explosion from his legs. Much respect to Jace as well, but his unwillingness to shoot just packed the paint and made it difficult for the bigs and messed up the spacing. Make or miss, those shots should’ve been put up. The loss of Brandon was when UH really took a turn for the worst. UH missed his perimeter D and his penetration. I hope coach implements more of a running offense. When UH went small and ran, I felt they were more effective. The post game would’ve been good (as it had been when UH was in the WAC) , but not passing out and not taking shots pretty much negated that. A good mix of both offenses would be great. Looking forward to next year. UH will be fine. For somehow UH doesn’t use a lot of screens to free shooters for open looks to the basket for 3s. Again, that’s a lack of coaching. And hardly any pick and roll. Maybe they don’t know what it is! What happened to Aaric Armstead? And Gerry Blakes? WOULD YOU Really Question or Talk of Firing Jaime Dixon in his Down Year(s)?